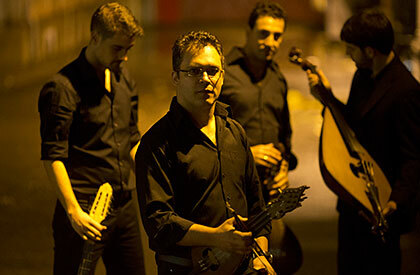 Led by lyra (fiddle) virtuoso Stelios Petrakis, the quartet performs the spirited and often hypnotic dance music and epic songs and laments of Crete. Played on traditional fiddles, lutes, and bagpipes, their repertoire includes arrangements of traditional pieces and new compositions by Petrakis that reflect a range of Mediterranean and Eastern influences. Petrakis (lyra, laoto - lute) is joined by Thanasis Makrokostas (askomandura (bagpipes), cello-lyra, dance), Antonis Stavrakakis (mandolin, laouto, vocals), and Giorgos Manolakis (laoto, vocals).